New Year's Eve means First Night, which started here decades ago. The week between Christmas and New Year's Day is one long festival in New England. On December 26th, the day after theChristmasholiday, the shops and stores re-open to mobs of bargain-hunters eager to get their hands on the heavily-discounted merchandise left over from the frenetic pre-Christmas selling season. Colleges, universities and schools are on vacation, so young people are everywhere, and especially in the cinemas. New Year's Day is a national holiday. It's when New Englanders rest from the joyful exertions of the night before, New Year's Eve, which means First Night for citizens of the eighteen New England cities and towns that have big First Night festivals. First Night varies from place to place, but the common theme is good clean fun despite the cold. Arts are prominent, including music, sculpture (ice sculptures are a favorite), exhibitions, costumes, and even parades with decorations and floats. Here's where to enjoy First Night in New England. 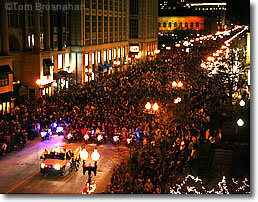 Huge First Night procession, Boston MA.